The story of this unique park demonstrates how a community can organize to reclaim and create a positive public space. Situated at the confluence of the Harlem and East Rivers, the site has a picturesque view of “Hell Gate,” or “Hellegat” as originally named by the Dutch colonists. Throughout the 17th and 18th centuries, this narrow strait between Astoria and Wards Island was infamous for treacherous navigational conditions caused by powerful tides and dangerous rock outcroppings. The 1780 shipwreck of the British ship Hussar and numerous other marine tragedies which occurred in this channel necessitated an 1876 effort by the Army Corps of Engineers to blast away much of the dangerous ledge. Unfortunately, in the years preceding 1985, the long-abandoned Marine Terminal had become desecrated with illegal dumping and graffiti, its panoramic vista inaccessible to citizens of Astoria and Long Island City. In 1985 a coalition of artists led by local sculptor Mark di Suvero came here with a vision for an outdoor sculpture laboratory dedicated to up-and-coming artists. That year, they began the arduous process of restoring the site, and named it Socrates Sculpture Park – both in honor of Socrates (469-399 B.C. ), the great Greek philosopher, and also as a tribute to the people of Astoria, New York’s largest Greek community. By 1990, when Socrates Sculpture Inc. was formed to raise funds, oversee the arts programming, and manage the daily operations of the park, di Suvero and others had restored this beautiful park and begun to develop its international reputation as a cultural institution. 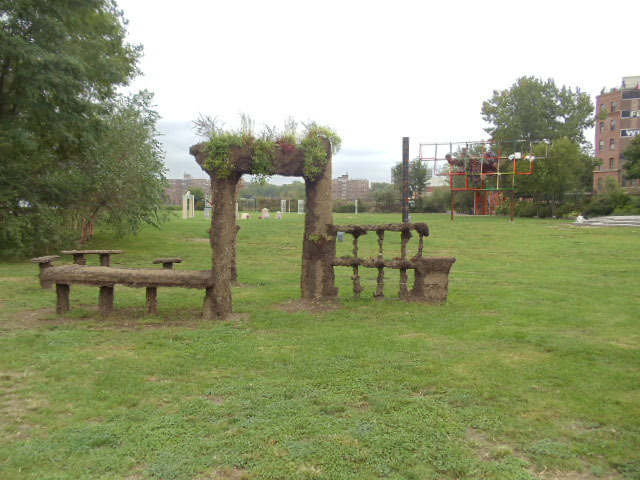 Socrates Sculpture Park offers tours to school groups and tourists, internships and apprenticeships to high school and college students, and employment to a number of area residents. Since 1993, the park has been under the jurisdiction of Parks. With assistance from Mayor Giuliani, Borough President Claire Shulman, and Council Member Walter L. McCaffrey, Socrates Sculpture Park has made many improvements. The enhanced facility provides numerous amenities to the community and expands opportunities for arts and recreation. Socrates Sculpture Park has been unique since its inception: it serves multiple purposes, as a major arts destination, a catalyst for economic development in the neighborhood, and open space access to the waterfront. Begun as one person’s vision to transform a vacant lot, the park is home to a collaborative enterprise involving a diverse array of local residents, artists, and government agencies to create a valuable community resource as well as a vital cultural institution.